Lately I’ve been obsessing over a rather strange thing: shower curtain rods. Weird, right? In one of my old apartments I had a tiny shower with a flimsy little plastic shower curtain. The transparent piece of plastic hung from a rod that ran from one side to the other of my square 3′ x 3′ shower. If I left the window open or if the rising steam created just the right pull the cold alien plastic would inevitably find its way onto my body. Not exactly the most luxurious experience. So I moved out and the landlord remedied the clingy shower curtain issue by razing that shack to the ground. Problem solved! But there had to be, I thought, a better, more efficient solution than moving out and bulldozing a building. Thus my obsession with more spacious showering facilities. I don’t remember when it was that I first took notice of the curved shower rod (it was, admittedly, long before moving into and out of the clingy curtain shack), but I remember thinking right away what a clever invention it was. If only my old shack shower had a curved rod, how much more luxurious would my bathroom have been! “Luxurious” may be a stretch, but it would have been much more convenient and a much more pleasant bathing experience. The ingenious quality of the curved shower rod is its ability to extract additional value from a seemingly already maximized situation. An enterprising attitude and a bit of ingenuity introduced a fresh look to an old but tried and true system. 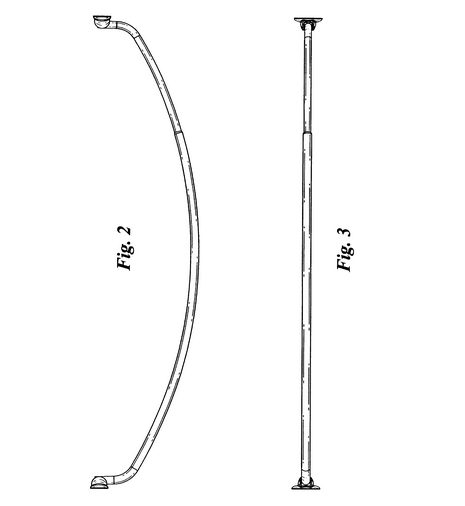 It was Jeffery Harwanko of Zenith Products Corporation who, in 2006, filed one of the first patents for the Curved Shower Rod. Before the curved shower rod there was the straight shower rod. The curtain would hang down from the rod and it effectively kept the water inside your tub as you washed and splashed around. Shower rod makers had identified a problem and developed a simple and valuable solution for addressing the challenge of not soaking your bathroom floor with splishing and splashing. It wasn’t rocket science. And it wasn’t exactly an astounding invention. It didn’t save lives or end poverty or send a human to the moon. And so we take this simple lil convenience for granted. But the Harwankos of the world look at the existing infrastructure, and envision ways to create more room, more convenience, more luxury. They find ways to extract more value. To put a number to it, some curved shower rod makers say this innovation adds as much as 33% more space to your shower. The bow-shaped, bended shower curtain rods that are used in homes and hotels the world over allow users to increase usable space, provide a sense of luxury (no more shower curtain sticking to your leg while rinsing the conditioner from your hair!) without requiring a nickel of investment in remodeling the floor or changing out your tub. And herein lies the point of this post: there are existing systems, practices, infrastructures that are chock full of value but can, with a fresh look, can have significant amounts more of value extracted from them. Innovation is a hot buzz word in business. Whether you call it increased efficiency, enhanced productivity, or innovation folks mean the same thing: how can we extract more value from challenges, and how can we extract more value from the already existing solutions for those challenges? The curved shower rod was a simple innovation Harwanko came up with that kept the plumbing intact and effectively remodeled the usable square footage of the shower. Where are there other places in your business or in your life where value can be extracted from existing infrastructure without having to disturb the existing plumbing? 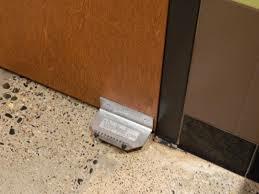 How many times have you gone to a public restroom and seen wads of paper towels tossed in the corner by the door? Germaphobes (which seems to be quite a significant portion of society these days) don’t want to make contact with the door handle. So they grab a paper towel and use it as a barrier to prevent their skin from making contact with the knob. StepNPull is not only helping make public restrooms more sanitary, but helping restaurants, hospitals and other commercial spaces cut down on waste. Connie Bruck, in her book Predator’s Ball, writes of how Michael Milken – the billionaire junk bond king – would use his Saturdays to hang out with his children and the children from the neighborhood. They had a tradition of going to their favorite grocery store where Milken would let all the kids pick out one of their favorite things. Milken was, in part, being generous. But he was also shrewdly collecting market research. He wanted to know what the kids thought were the hot products. Kids, as we know, can be powerful influencers on household buying decisions. Even if indirectly. Perry Mendel, founder of KinderCare learning centers and daycares, bought his first child care center in 1968. A real estate entrepreneur and financial guru, he had an idea for a chain of daycares. After a year of learning the ropes of this new business, he developed a way of scouting and determining new locations for his KinderCares: He drove around neighborhoods during the middle of the day looking for swingsets and empty driveways (parents at work). He focused on middle class neighborhoods with two working parents. He talked to mailmen, sought out new elementary schools, and created a profile for promising locations. These two guys were observant. StepNPull creator noticed lunatic people opening bathrrom doors with their elbows. Milken informed his market maneuvers and investments by watching what kids consumed. Mendel took note of demographic trends in the workforce (more women working) and then devised a clever way of identifying neighborhoods where this trend was accelerating. Creating value is not hard. People create value all the time. Extracting value is what separates a businessman from an ideas person. We all have ideas. But the only way an idea will take flight – and sustain flight – is if it makes money. What system do you have, what framework have you developed, to extract value from that idea? Husband, Father, Author, Entrepreneur, Optimist. Thank you for mentioning stepnpull we need all help we can get. Copyright (c) 2014 Chris Drew. All rights reserved.